Candy corn is one of my favorite images of fall! As I began thinking about writing this blog post, I started wondering about the history of candy corn. It turns out that a candy maker named George Renninger likely invented these sweet little yellow, orange, and white treats in the 1880’s while working at Wunderle Candy Company in Philadelphia. At one point, they were named “chicken feed”. The same basic recipe is still used today. I also discovered these sugar packed treats are fat free. National Candy Corn Day is celebrated on October 30th. Here are some math (and other) activities you can use to join in the celebration. 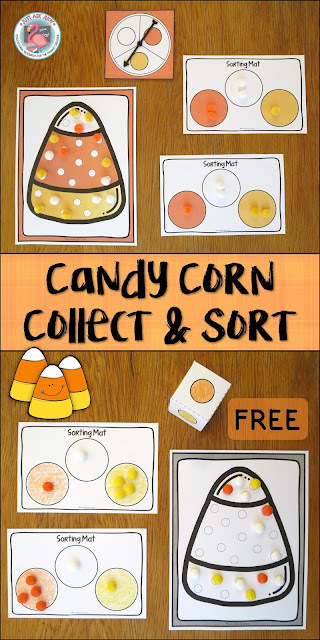 Candy Corn Collect and Sort, a free download, is a partner activity designed for preschoolers and kindergarteners. For young learners, the focus can be on color matching/ identification and fine-motor skills. Older preschoolers and kindergarteners can count; write and represent numbers; and graph and compare quantities. Choose color or black/ white. Choose to use a spinner or a cube. Print and cut. Color the black and white, if using. The spinner can be made with purchased hands or a paperclip and pencil. Fold and glue the cube. Print one candy corn game mat for each pair of players. Print one sorting mat for each player (optional, 2 per page). Color code the black and white. Choose and print one or both optional recording sheets. Take turns with a partner. Spin or roll. Collect one counter with your color. If all the counters with your color have been collected, you lose your turn. Play until all the counters have been collected. Count to find out how many of each color you collected. Complete one or both of the optional recording sheets. The circles can be colored to match the color word. 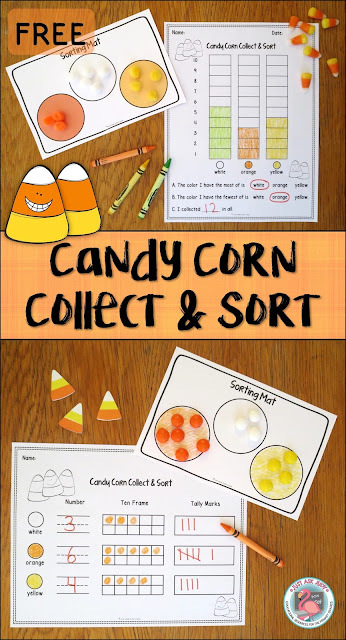 Indulge a little and play Candy Corn Collect and Sort to celebrate National Candy Corn Day! You might also be interested in these candy corn themed math resources ($) available in my TpT Store. To help you celebrate, these will be marked down through Saturday, October 22nd. 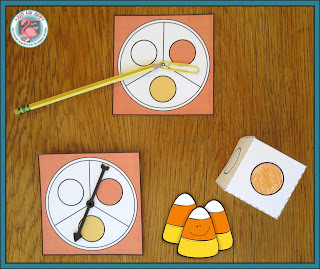 Candy Corn Counting Grids, perfect for preschool and kindergarten, uses dice and counters to focus on subtilizing, counting objects with one-to-one correspondence to 20, 30, or 40, and comparing quantities. Candy Corn Critters Number Sense 1-10 is a resource for preschool and kindergarten that incorporates dice patterns and ten frames with counting, writing numerals, writing number words, one less, one more, and representing a given quantity by drawing, with tally marks, and on ten frames. Candy Corn Critters Number Sense 10-19 is an activity for kindergarteners and some some first graders that incorporates base ten blocks or ten frames with writing numerals, writing number words, one less, one more, and representing a given quantity with tally marks, on ten frames, and by drawing base ten blocks. It’s in the Bag for Autumn- A Data Collection and Graphing Activity, ideal for first, second, and third graders, has an activity using the words candy corn. 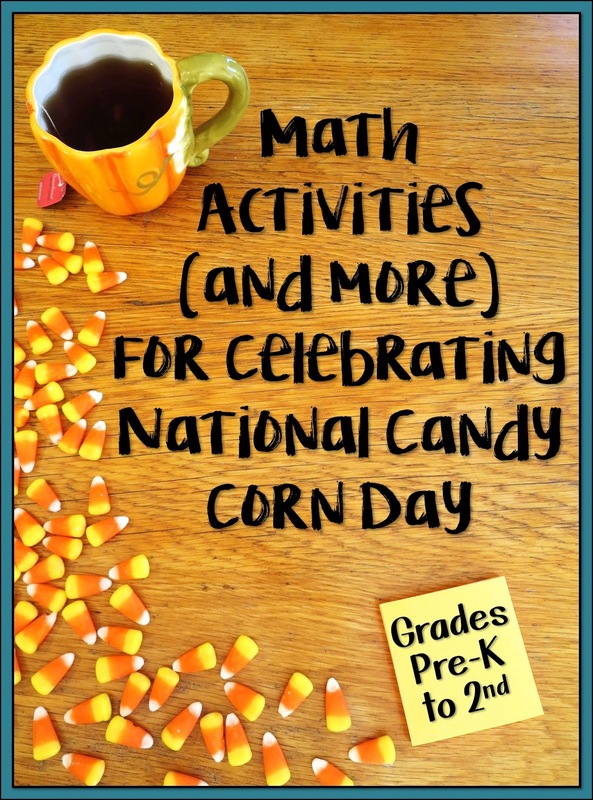 Check out these links for more candy corn themed activities for learning and enjoyment! How do you plan to celebrate National Candy Corn Day? Stop in and browse through the links on these blog posts. Judy, I loved the candy corn tidbits of information. 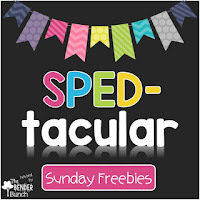 And, what a great freebie! It was one of my favorite candies as a child. The activities are sure to be a hit. I love using candy for ANY math or science activity! Great ideas!